I was resting on my laurels a little bit late last night, after completing the Imperial 70 transformation (previous two posts), when around about the witching hour a comment arrived from Richard Polt asking about the foam degreaser I had used in the job. 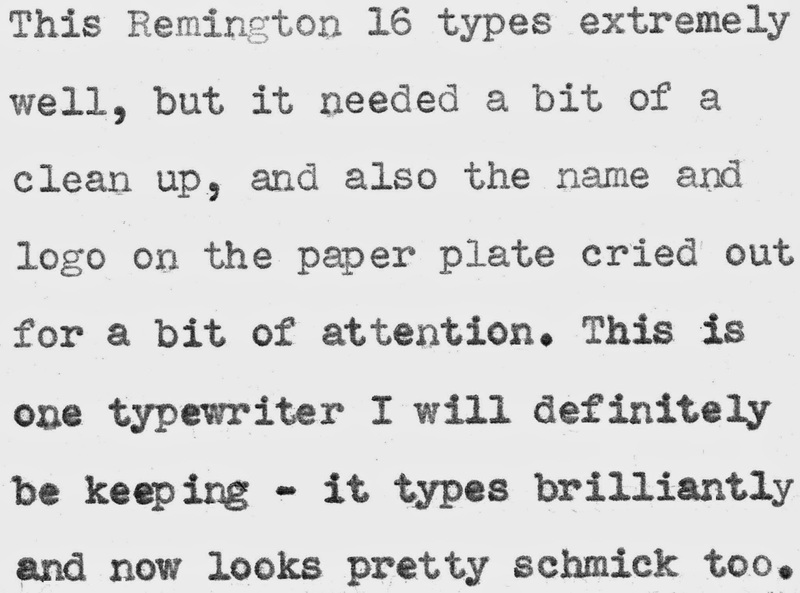 Such is my dedication [-:)], I immediately ventured out into the pitch black, the freezing cold and driving rain and fetched this Remington 16 standard typewriter with cork platen up from the shed downstairs, hoping to be able to demonstrate the effectiveness of the foam. The idea was to spray some on particularly dirty areas at the back of the Remington and leave it to soak in overnight. But of course the foam started to act in an instant, and within a few seconds had produced results which were all too evident. Which was a good thing, as I don't allow the foam to remain on paintwork for more than a minute at the very most. It tends to almost irretrievably dull any sheen that's left. It's also not good for decals. After spraying on the foam, you can literally see the dirt being lifted off the grime-encrusted surface of the machine and washing down from it, to form yucky brown puddles of muck under the typewriter. This spray is especially useful when dealing with "crinkle finish" paintwork, as it obviously penetrates into the crinkles, deep into the surface grime. But remember it is meant to be used primarily as a degreaser, so it has pretty heavy-duty solvent properties (d-Limonene). When using it, be wary about leaving it on paintwork for too long. Ditto with platens. Instructions on the can emphasise this - warning against "prolonged exposure" to painted metal and rubber. By all means leave it and let it do its great work on metal parts, on the mechanics of the machine. Any review will tell you how extremely effectively it works on removing blackened grease and grime from inside the typewriter, built up, in most cases, over many, many years. Mention of decals brings me to another task I have tackled at the start of work on cleaning up this Remington. I was asked by Piotr Trumpiel at the weekend about making decals, in a comment from Piotr on the McTaggart-Riter. There is a full "revelation" of my secrets in the "art" of decal-making in this post from March last year. Here is how the Remington 16 appeared when it arrived here. On the paper plate, the blurry, faded remains of the logo and the obliterating scratches through the brand name did not make for a good look. This is often the case - especially, I find, with old Remingtons. Using white decal paper will inevitably leave a few tiny white lines around the logo when applied to a black surface, where the transfer sheet has been cut, so a bit of a touch-up with a black felt-nib pen may be required. Remember, only you will be looking at this through a microscope, and spotting any small imperfections, no one else. Finally, at least to this point, I test typed with the machine. The ribbon had faded badly and hardly left any impression. So I simply opened up the little shutters on either side of the typewriter and sprayed in some Australian Export lubricant as I spun the spools around with the handle on the back right. I ran the ribbon back and forward a couple of times to allow the lubricant to soak through the cotton and, hey presto, I have a perfectly good ribbon again - almost new! This is an old Richard Amery trick and I have used it for many years (as I have the degreaser foam), invariably with much success. It's still a little uneven in the typecast above, but it will spread evenly in short time. Yet another gem of expertise from the typosphere that I have safely tucked away in my Evernote Typewriter Conservation notebook. Thanks for taking the time to put this together, Robert. Great job with this fantastic machine, Robert! 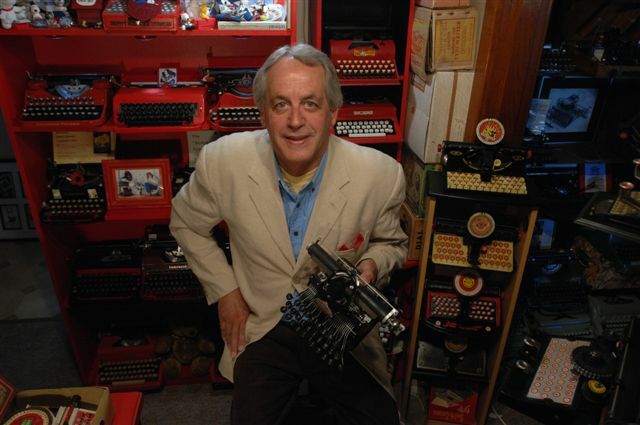 I agree, the Remington 12 / 16 are fantastic typers; I really enjoy using my 12. I like the look on the refurbished decals! Thank you for sharing your knowledge and experience again! Very interesting. Thanks for risking life and limb to demonstrate the foam! Its effects on the exterior of the machine are similar to those of Scrubbing Bubbles, which I use regularly on wrinkle-painted typewriters. After using it on the interior, do you need to rinse away the residue somehow? Thanks again for all these tips. I feel honoured. Great job!